We've seen more and more photos on social media of amazing flies tied by fly tyers like you. The flies we've seen are just the tip of the iceberg, so we're holding a fly tying contest on Instagram to help you show off your patterns to the world and give you the chance to win grand prizes from Flymen Fishing Co., Howler Brothers, Rep Your Water, Loon Outdoors, Kona Fishing Products, Hareline Dubbin, Taylor Fly Fishing, and Cortland Line. Tie a fly that integrates a Flymen fly tying material (Fish-Skull®, Nymph-Head®, or Surface Seducer®) and take a photo of it. Post the photo on Instagram, list the Flymen material(s) you used, tag @flymenfishingco, @howlerbros, @repyourwater, @loonoutdoors, @konafishing, @harelinedubbin, @taylorflyfishing, and @cortlandline in your post (make sure you're following all of us! ), and hashtag #FlymenFlyTyingFreeForAll2019. The Flymen team will vote to choose 1 weekly winner for 6 weeks. Winners will be announced on the Friday of each week, starting Friday, April 19th. The criteria for winning can be anything from realism to creativity, so go crazy with your design. Streamers, nymphs, and foam flies are all welcome. We love seeing innovative ideas. Entries are eligible to win through the duration of the contest, meaning a photo you post on the first week could be a winner on the last week. I posted some fly photos before the contest started... Can I enter them in the contest? Photos from the past can be entered in the contest, BUT they must be re-posted (simply adding the hashtag on a photo from 3 months ago doesn't count). At the end of the 6 weeks, we will re-post the 6 winning flies on a webpage for a voting period. After the voting period, the prizes will be awarded to the fly tyers in order based on how many votes they received. Everyone who votes in the final round will be entered into a sweepstakes to have the chance to win the same 6 prizes as the fly tyers! So even if you don't win a prize in the contest, you may walk away with a great prize pack just from voting! 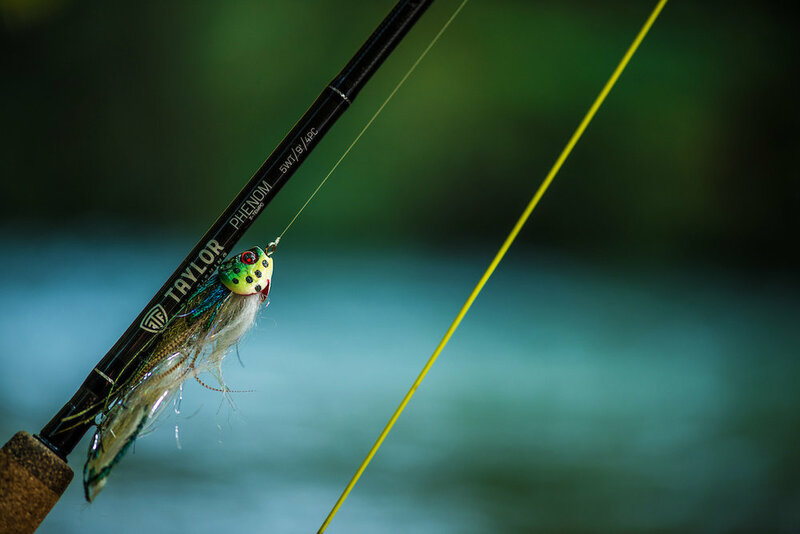 1st place – Taylor Fly Fishing Revolution Z Fly Reel ($479 value) + Cortland Line $100 credit for products of your choice and 1 spool of Top Secret Tippet ($20 value). $599 total prize value! It was my first paid/guided fly fishing trip in southern Florida. Standing on the bow of the flats boat, all of the sudden my guide points out a moving object about 75 feet away. It was a LARGE PERMIT! I make a quick cast that reaches about 50 feet, still 25 feet short of where I need to be casting. I quickly strip my line in for a second cast only to see that moving object jet away from the boat at full speed... I missed my chance! Uggg if only I made a better cast! That was many years ago, but that moment changed me as an angler. I no longer settled for being an average caster and I began to work diligently on crafting my cast! 1. Distance casters are accurate casters - If you can cast an entire line chances are you accurately hit a target at 20', 30', 40', 60', etc... Distance casting requires excellent technique which translates into an accurate short cast. 2. Salt-water fly fishing requires distance - If you live in trout country and only fish creeks, distance probably doesn't matter much to you, but once you get into salt-water everything changes. Salt-water often requires a quick, accurate, and long distance cast to get the fly where you need it. There is nothing more frustrating than paying top dollar for an exotic guided flats trip only to miss fish after fish because of an underdeveloped cast. 3. Distance is the answer on windy days - Being able to generate high line speeds and tight loops pays off in windy conditions. The techniques you use to cast far are very useful when the wind becomes a challenge. 4. It's fun! - Let's be honest, fly fisherman are a slightly different breed of people. We tend to be passionate and even slightly obsessive about our sport, our waters, and our fishing! Distance fly casting is fun for us passionate anglers! Some of the many joys of being a fly angler are feeling the line load the rod, seeing that tight loop, and making a perfect cast. I have a short list of things to learn and practice in order to learn how to cast 100 feet with a single hand fly rod. I can consistently cast 100' with a 9' 4wt fly rod and a standard fly line. It's not as hard as you might think. This isn't an exhaustive list but a great place to start. If you can learn all these techniques you will be casting 100' in no time! This list isn't in any particular order. Youtube also has some great videos on distance casting! 1. Learn to form tight loops - Tight loops look like a long sideways U shapes. There are plenty of books and videos on forming quality loops. TIGHT LOOPS ARE NOT OPTIONAL WHEN IT COMES TO ACHIEVING DISTANCE! 3. Straight rod path - Essentially this means your rod tip needs to make a straight line as it travels back and forth while casting. A straight rod path is a requirement to creating tight loops. If you find your loops tailing or being overly open... check your rod tip path. 4. Learn the double haul - Again youtube is a great resource here. The double haul often feels strange when you first learn it, but eventually it will become second nature. 5. Learn to carry line in the air - The more line you can carry in the air the further you can reach. To hit 100' I like to carry about 60'-70' in the air and shoot about 40 feet. If you can carry 60' with a good double haul 100' is easily reachable. 6. Forget the 10-2 thing - When you are first learning how to cast the 10-2 principle can help, but as you learn to cast further, your casting motion needs to change. You have to extend your reach in order to generate fast line speed. 7. Creep is bad... creep is good - Creep typically means your hand drifts forward too early and takes away from the power of your cast. That's bad... What you want to do is allow your hand to slowly creep (after a hard stop) towards your line creating more power in your cast. This often looks like a slight rocking motion with distance casters. 8. Create a hard stop at the end of your cast - A hard stop allows the bend in the rod to release creating forward trajectory. A firm grip will help you to create a hard stop as you are casting. We hope some of that info helps! Now get to the park and practice, practice, practice! Our two new premier products are getting ready to make their official debut! 1. The first 25 rod and reels that are ordered will be 20-25% off retail! 2. Anyone who orders in the first 24 hours will be entered into a drawing to get both the Truth rod and Revolution Z for FREE! 3. All rods and reels will be a minimum of 15% off during the entire 30 day campaign! 2. At 7:00PM MT go directly to kickstarter.com and search Revolution Z in the search bar. The Early-bird specials will sell out extremely fast so be quick to checkout! If you have questions, drop us an email. What does fly rod action mean? What does fast action, medium-fast, or slow action mean and why is it important when picking a rod? Rod action can be confusing to understand for many anglers. One of reasons why action is hard to explain, is that there is no set standard or definition within the fly fishing industry for what action means. What is fast for one company might be medium-fast for another and vice versa. Also one companies definition of action might be slightly different from another. Here is a short list of words and definitions that will help you to understand fly rod action to a greater degree. 1. Recovery speed - How fast the rod returns to straight after being bent or cast. The stiffer the rod the faster the recovery. 2. Flex or rod profile - Where the rod blank bends. A mid flex rod bends closer to the middle of the rod when cast. A tip flex rod bends more towards the tip when cast. 3. Line speed - How fast the line move through the guides when being cast. Rods that generate higher line speeds will shoot line further after a proper cast. 4. Action - A combination of flex profile or taper (where the rod bends) and stiffness (the rods recovery time after being bent). The benefits of fast action rods are that they typically cast further and generate higher line speeds, while the downside being a lack of feel and accuracy during shorter casts. Not all fast action rods are designed exactly the same, this is where rod profile becomes critical to understand. A fast rod with a flexible tip will have more feel and acuracy in closer ranges than those with stiffer tips. A fast action rod with a stiff tip can typically cast a mile, but can be a chore up close. Next time you are looking for a rod don't just focus on action, but pay attention to the flex profile. Also fast rods are not necessarily better than slower rods. The slower the action the more forgiving a rod is during a bad cast. A medium or medium-fast rod are typically better performers for short range fishing situation (and can be more enjoyable to fish because of the ability to feel the rod to a greater degree during the cast). There is no right or wrong rods (well there are some rods that are wrong for everybody). Your rod choice should be determined by your experience level, preference, fishing situation, and budget (for most people). This year at the IFTD show we introduced three new products with high praise. Our new T1 reel, Anthem rod, and Truth rod were received with high praise. The T1 is a throwback in design to our original TYPE1 reel with a modern updated edge. It features a sealed drag system, is light weight, and comes at a very affordable price of $240-$260 USD. Our new Anthem rod received a generous amount of praise with its beautiful golden olive, lightly sanded blank and flawless performance. It's our new medium-fast action rod with an MSRP in the low $200s. Our new Truth rod is our flagship fast action model featuring the highest modulus graphite, titanium components, beautiful high quality cork, and a stealth look. Keep an eye out for these new products at our retailers and online later this year! Billfish, shark, marlin, amberjack, barracuda, bonitos, jack, and tuna are some of the many reasons I have become addicted to offshore fly fishing. My first several trips offshore I faced the daunting challenge of figuring out what in the world I was doing. Not a lot of people fly fish offshore and when they do the techniques are varied and ambiguous. Before my first offshore trip I researched and prepared the best I knew how, but I still had a lot of questions. Here are some tips, gear advice, and info that can help you when it comes to fly fishing offshore. 1. The fasting sinking fly line you can find - My first trip offshore we pulled up to a wreck and immediately there were fish all around the boat. The problem was they were about 30'-50' below us and I only had an intermediate line. Try as I may, I struggled to get the fly deep enough to get a take. After that I went home and bought the biggest and heaviest fly line I could find. That line was a game changer on my next trip when I encountered a very similar situation. Deep water = Deep fish. 2. 12wt+ Rod - Big fish means you need a big rod. Imagine hooking a large shark, tuna, amberjack, etc, and being stuck with a smaller rod! I usually throw a 12wt rod or bigger. 3. 8wt -10wt rod also - I know I just said you need a 12wt rod, but fly fishing offshore in tropical environments can throw many different situations your way in one day. Bring your trusty 8wt flats rod with floating or intermediate line. If you run into a school of fish chasing bait or dorado handing around a weed line the 8wt will do the trick and can be easier to cast off the boat! 4. Thick tippet and wire - I normally throw 30lb mono straight leader offshore, but always carry wire tippet with me. Trust me, its very frustrating to get repeatedly cut off by large barracuda or shark because you forgot your wire. 5. A reel with a strong brake - I fish our Revolution reel offshore every time! The 25lb drag brake is an absolute must. 6. Big flies tied on big hooks - Big flies that push a lot of water are a must. I find large single hook musky or pike flies do just fine. I like weighted flies to help get the fly down quickly. It's also important to have a variety of different saltwater flys in your box. You never know what you will run into offshore. 1. Fish wrecks and underwater structure - Fish love any structure they can find. Any good captain will know the wrecks and locations where fish commonly hold. It's very common to pull up to a wreck and find that their are fish all around the boat in a short amount of time. Fish see the boat and get curious which will draw them near. 2. Use live bait and chum - Some purists don't like the use of chum or bait to bring the fish in. I think why waste time making your fishing harder than it needs to be. Chum will bring the fish to the boat and live bait (tossed off the boat one at a time) will tease the fish into casting distance. 3. Trolling works (bait and switch technique) - Trolling usually involves conventional rods with hookless lures to bring the fish to the boat close enough so you can cast your fly and hook the fish. This is a common technique for billfish or marlin. 4. Chase birds and agitated water - If you see birds diving into what looks like a bubble bath you have found a school of hungry predatory fish. The challenge is to get close enough and quick enough to get your fly into the feeding frenzy! If you can it's going to be game on! 5. Follow shrimp boats, weed lines - If you can find a large shrimp boat in your travels it can be extremely lucrative to give them a follow. Fish will often follow them feeding off the bi-catch. Make sure and be courteous to the boat before you start chasing them around! Most captains don't mind and some will even trade some shrimp for a magazine, newspaper, etc... (shrimp boats can be at sea for long periods at a time). Weed lines or other surface structure also often hold fish. 6. tease fish to the surface using hookless lures - Sometimes you can pull of to a wreck but the fish just won't come up form the bottom. I have found throwing a conventional rod with large crank style lures (no hooks) can help tease the fish from the bottom to the boat. Once the fish are near the surface switch out for the fly rod and get ready! 7. Keep your fly in the water - Last summer I caught a black fin tuna on the fly rod! It was a thrilling catch, but I never would have caught it if I hadn't kept my fly in the water. Before I hooked up with the fish, I hadn't seen anything moving in the water for about 20 minutes, but yet I kept casting, letting the fly sink, and stripping it back in. While I was doing this it just so happened that a school of tuna swam by and took the fly! I didn't see them coming, nor was I expecting them, but keeping my line in the water paid its dividends! Fly fishing offshore can be intimidating and challenging, but sooo rewarding! These tips and tricks can help, but they are only a starting place. I know some of these tips are unconventional... but they are effective. Hire a good captain, get offshore and see what you can do! I guarantee one good day with the fly offshore will have you hooked for life! Maybe you have some advice we didn't list. If you have any other tips leave them in the comments section... Tight Lines!